Toyota Motor Corp. reported its first quarterly loss in two years on Tuesday as Japan's biggest earthquake on record hammered production and the yen's rise hit profits on exports. The automaker made a global operating loss of 108 billion yen ($1.4 billion) in the April-June quarter, compared to a 211.7 billion yen profit a year earlier. In Europe, the automaker reported that its operating loss grew 700 million yen to 7.5 billion yen. Toyota said unit sales in its European markets fell by 13,000 to 174,000 in the period. In North America, Toyota's operating income fell by 80.8 billion yen to 28.9 billion yen, while in Japan, the operating loss from the automaker's Japanese operations increased by 179.1 billion yen, to 206.6 billion yen. The global result was better than the average loss estimate of 190 billion yen in a survey of six analysts by Thomson Reuters. Toyota posted an overall global net profit of 1.2 billion yen compared to a 190.5 billion yen net profit the previous year. Worldwide revenue fell 29.4 percent to 3.44 trillion yen. For the full year to March 2012, Toyota raised its global forecast for operating profit, which excludes earnings from China, to 450 billion yen. A poll of 20 analysts produced a forecast of 529.7 billion yen. "It is a relief to see that their production is returning to normal. 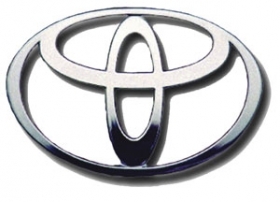 They (Toyota) have raised their earnings forecasts. However, looking at the share price and PE, the profits are still too low. The share price won't rise until profits come back a bit more," Koji Toda chief fund manager, Resona Bank, said Tuesday. The supply constraints from the March 11 earthquake have eased faster than initially feared and Toyota has said production volumes will recover to pre-disaster levels in stages starting from July. But the dollar's drop far below the 82 yen that Toyota had assumed for the year to March 2012, is set to eat further into profits as Toyota exports more than half of its vehicles produced in Japan. "Unlike in the past, their products are mostly consumed outside Japan, so there is no need for them to go to the trouble of manufacturing in Japan. In the medium term, the trend will be for them to produce where the products are consumed. I don't think it can be stopped," Toda added. Even before the March disaster and the yen's recent surge, Toyota has been trying to slash costs by roughly 30 percent to take on South Korea's Hyundai Motor Co., which has boosted its market share globally in recent years. With the dollar around 77.7 yen , Toyota executives had warned that keeping as much production capacity as it has in Japan was illogical, although they have stopped short of flagging a politically sensitive shift overseas. The company said it now assumes a dollar rate of 80 yen instead of 82 yen this financial yen, and the euro at 116 yen instead of 115 yen. On Tuesday, the dollar was trading around 77.35 yen while the euro was around 110.25 yen. Toyota has said it will continue taking steps to lower the cost structure of its domestic operations to keep annual production of at least 3 million vehicles in Japan in the interest of protecting Japanese jobs and manufacturing. ''Toyota remains committed to pursuing an improvement of its earnings structure globally through cost reduction activities in which it has strong track record, and to utilizing every opportunity to increase production and sales outlook,'' Takahiko Ijichi, Toyota senior managing officer, said Tuesday in a statement. Last month, the company announced plans to streamline vehicle development and production.